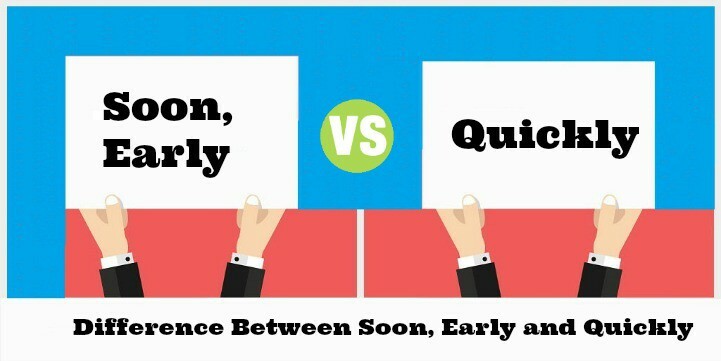 Summary: Difference Between Soon, Early and Quickly is that Soon means ‘a short time after now or then’. Early means ‘near the beginning of a period of time we are talking about’ and we use quickly to refer to the speed with which something is done. Soon means ‘a short time after now’. Soon can also mean ‘a short time after then’. Early means ‘near the beginning of a period of time we are talking about’. Early does not mean soon. He had an accident early this month. Early can mean ‘before the expected time’. Early can be used as an adjective. We will be grateful for an early reply. There is a difference between soon and quickly. We use quickly to refer to the speed with which something is done. Soon means ‘before long’.